Mabel Louise & Warren Steward founded WWIB in 1972. 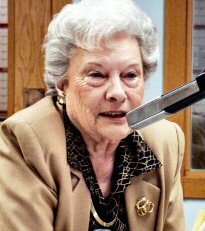 Since the beginning of our broadcast ministry, Mabel Louise has played an active role in Bible teaching, counseling, and public speaking. Listen for her Tuesdays and Thursdays at 11:15 am. WWIB is 103.7 FM throughout western Wisconsin. Listen from everywhere at wwib.com streaming. Mabel Louise, live on wwib, Tuesday morning at 11:15. To download the file directly to your computer, Right-click on "Download" word in Windows or -click on a Mac and select "Save As" or "Save Link As" in the pop-up menu.